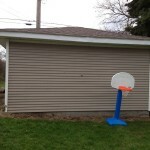 The need for a garage side door became evident upon moving into our new home. We have a small, one car garage. 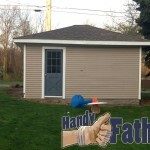 It functions as a shop and a shed for this Handy Father. With a large metal Garage Door, on one side, I was the only one able to enter easily. 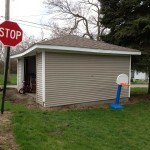 I knew that I wanted a side door for the garage, so the kids could use it to get their toys and bikes. Also, my wife prefers not to open the large door. The first thing I did was select the location for where I wanted the door, and made mental plans for the garage side door installation. Searching craigslist, I was able to locate several doors that would have worked. I didn’t want to spend much, and had a set of criterion that I just wasn’t finding. The solution to my need for a garage side door happened while I was talking of the project with my friend, Scott, who is the founder of Selling Songs, a site for people who want to sell their songs. He said that he had a couple of exterior doors taken from an old lake house before it was remodeled. The price was right, and the door is nice! A Solid wood door with several glass panes make my garage side door, the best part of the structure. I took measurements of the door and laid out a plan for installing it. I chose a section of the garage with three studs, and removed the center stud. Then I framed in the doorway. 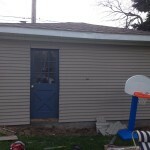 Since this was to be a garage side door, I didn’t bother with a standard door framing. I used double studs on the sides, making sure they were 1/8″ wider than my door itself, and level. Once framed, I drilled holes through the siding from the inside, and marked the location of the door on the siding. I used my circular saw from the outside and cut through the vinyl siding and old wood siding on my marks. Then I mounted the door using some standard door hinges that I had salvaged from some other project. I mounted the door on the innermost part of the double studs, and have the door opening into the garage. The door came with a handle on it already, but I didn’t have a key. I purchased an exterior door handle and had it keyed to match my existing house keys. This way I don’t have to add to my key ring. It installed easily on the door. I had to remove material from the latch side of the doorway to allow for the door to latch shut. I marked where the latch plate should go, eying the latch itself, and used a 1″ spade drill bit to make the hole. I attached the plate with the screws provided. once the door shut and latched, I added some 1×3″ strips of wood on the outside of the door with hardwood trim nails. This serves as a stopper for the door. It also eliminates light coming through the cracks. 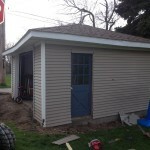 I cut the vinyl siding around the exterior back enough to add some 1×4″ trim. The is old and brittle, so I had to painstakingly cut it with a Stanley Knife to keep a straight edge. The last thing I did was remove the door, and paint the frame white to match the garage trim.